Whether you’re a stay-at-home mom or dad, an aspiring entrepreneur, or someone who’s just looking for a new way to get money, the internet, and Amazon particularly, offers lots of neat ways to make money. Here at Jungle Scout, it’s a well known fact that we’re fans of Amazon. 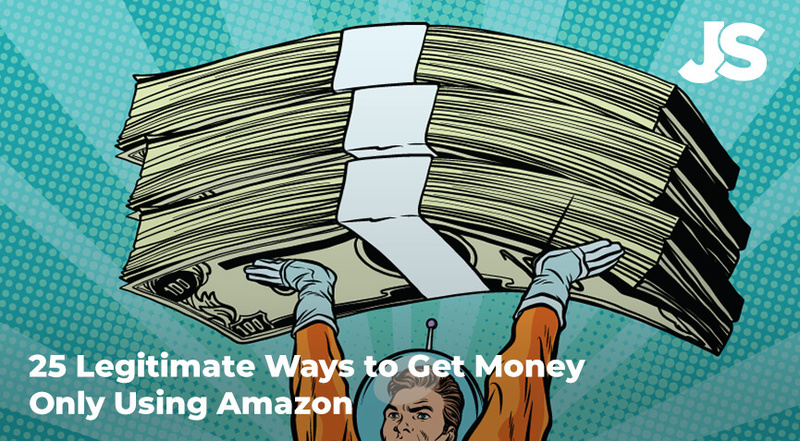 And for our “money” (no pun intended), we think Amazon offers not just one or two ways to get money, but we can actually count 25 legitimate ways to get money using just Amazon. This list doesn’t only include our favorite method of making money with Amazon, which is private label. It also shows how that anyone, no matter what your skill set might be, can get money using Amazon. Of course, if you’re interested in learning more about private label with Amazon, click the button below. Sell branded products on Amazon. 1 – Sell used books on Amazon. For someone just starting out on Amazon who wants to sell physical products, selling used books is a great way to start. The first, most popular way, is to go to sales and scan used books with your cell phone. Most of these “book-scanner” folks will have an app on their phone that lets them know if the book has any value. You can also just buy books wholesale. This is actually how I got my start with Amazon. I would go to yard sales, library sales, closed book stores, and estate sales to buy books by the hundreds. Then, I’d sort through the books to find “hidden gems.” There’s a few different methods of doing it, too. Another one of my favorite book-selling methods was with online arbitrage. I’d find the books for cheap in one online market and resell them on Amazon. I still do a little of this to this day. If you’re interested in learning more, read the article below. 2 – Do Amazon retail arbitrage. The big news this year is that Toys R Us is closing. That means they’re going to be having a lot of “going out of business” sales. That means that the arbitrage sellers are going to out in force looking for deals to resell on Ebay and Amazon. A popular, old school method to get money, online arbitrage is where you go to physical retail stores and look for discounted goods to resell online. You might remember Dwight from the US Office doing something similar with those Princess Unicorn dolls. Personally, I always felt like retail arbitrage was a lot of work for very little margins. Therefore, as a method to get money with Amazon, it’s not the best. That’s why I prefer the online version. 3 – Try Amazon online arbitrage. Similar to retail arbitrage, online arbitrage is all about finding cheap products in one place to resell on Amazon. However, the big difference is how you source the products. Online arbitrage is all about finding deals online. You can use Ebay, Target.com, Craigslist, or even Facebook. In fact, you can even find products on Amazon to resell on Amazon. This method is known as zen arbitrage. It works as a way to get money with Amazon because you’re buying products sold by fulfilled-by-merchant (FBM) sellers and reselling those products as a fulfilled-by-Amazon seller (FBA). Textbooks are perfect for zen arbitrage selling due to the wide difference in price between FBA and FBM. Guess those students need their books quick! 4 – Drop ship products on Amazon. Drop shipping is a method of promoting and selling the products of another business without actually holding any inventory. The way it works is simple. First, you set up a drop shipping agreement with another business, usually a manufacturer or distributor. Then, you list the product on Amazon. When a sale is made, you contact the owner and let them know a sale has occurred. They will ship that product on your behalf. To the customer, it looks like the product came from you, despite it coming another business. And the best part of all, it’s totally legitimate. Businesses encourage this because it’s like free advertising for them. But I’m sure you’re wondering, how do I get money from this? The money that you make is the difference in price between what you sell the product for and what you purchase it from the owner. There’s tons of way to do this, but one of our favorite ways to find drop shipped goods is through Aliexpress, which is part of the Alibaba network. 5 – Sell collectibles on Amazon. This is another one that sort fits into the online arbitrage and retail arbitrage categories of ways to get money using just Amazon. However, collectibles is a unique area since it requires far more expertise. There’s lots of different collectible categories to operate in on Amazon, too. You can sell old comic books, board games, coins, and even sports memorabilia. Just be sure that you understand Amazon’s policies on a lot of these collectible categories before you jump in. You can learn more about gated categories with the article below. 6 – Wholesale products on Amazon. Finally, as a way to get money on Amazon selling the products of other companies, wholesaling is the king. Wholesaling is when you buy pallets, shipping containers, or just large inventories of products to resell on Amazon. While it’s definitely more involved than some of the other methods I’ve mentioned, wholesale selling is one of the ways to quickly earn millions selling on Amazon. Previously, we covered this method on a webinar here on Jungle Scout. Related Article: Can You Make Money from Wholesaling on Amazon? Create your own products to sell on Amazon. 7 – Make handcrafted products to sell on Amazon. Many people know that Etsy is a great place to list your own handmade products online. But did you know that another way to get money with your own goods is by selling them on Amazon? That’s right, Amazon has its very own handcrafted products platform. It works in a lot of ways like the other “create your own” product listing methods outlined in this post. And typically, you’ll sell and fulfill these products yourself. But because you’re selling on Amazon, you’ll find yourself exposes to a much larger audience than you normally would. Remember, Amazon has close to 2.4 billion people visiting the US site each month. Hope you’re ready to start cranking out those homemade goodies! 8 – Develop a private label product to sell on Amazon. Private label is the process of researching profitable niche products on Amazon, sourcing those products through Alibaba, then creating your listing to launch those products. It’s like a cross between wholesaling and handcrafted. All you’re doing is retooling and existing product as your own brand. And it’s absolutely insane how easy this is to do! 80% of the top sellers on Amazon, those pulling in 7-figures or more each year, are all private label sellers. So if you’re interesting in taking an online business to the next level, then definitely check out private label. Be sure to check out the video above to learn how to make money with Amazon private label. In our opinion, private label is not just the best way to get money using Amazon, but we’re pretty sure that it’s the best way to make money online period. And it’s a method we cover extensively on this site. 9 – Write ebooks and sell on Amazon. What’s probably my second favorite method of making money on Amazon, is writing ebooks. Recently, I read a post from James Altucher talking about a guy who makes $40,000 per month writing nonfiction books for Amazon. All he does is target hot topics, write a 70-100 page ebook on that topic, and release it. And even though not every single book he writes is a big hit, 20% of those he publishes make up for 80% of his income. What’s cool about this method is that you can actually use our product research tool, the Jungle Scout Chrome Extension to find hot Kindle topics and check for competition without having to do a whole lot of research. That’s just one of the many cool uses of our tools. If you’d like a tool that helps you find profitable niche topics to write about quickly, try out Jungle Scout’s Chrome Extension. It’s super easy to set up! Provide freelance services for Amazon sellers. 10 – Do product photography for Amazon sellers. Every single product that goes up on Amazon needs product photography done. And while we’ve already demonstrated that private label sales on Amazon is super easy, what we failed to mention is that some of the marketing stuff will require some professional help. But if you’ve already got photography chops and know what you’re doing, you can easily make a living taking pictures of other sellers products. There’s lots of platforms you can do this, but for our money the best one to offer your services on is Jungle Market, which is actually set up specifically for Amazon sellers. Related Article: Check out the new Jungle Market. 11 – Offer graphic design work for Amazon sellers. Speaking of Jungle Market, another way you can get money with Amazon is by offering graphic design work to Amazon private label sellers. Design work can include making logos, designing packaging, or even doing infographics for brand registered content. Not everyone is a whiz with Photoshop, Illustrator, Corel Draw, or Sketch, so if you’ve got those skills, here’s another great service to offer. 12 – Assist with translation for Amazon seller products. Amazon sellers often branch out from the US market to sell in the European Union, India, and sometimes even China. However, the one thing that holds a lot of those sellers back from taking that leap is that they don’t know how to speak the language. If you’re someone who is bilingual and understand a little bit about writing sales copy, then you might be able to offer your services as a translator with Amazon seller products. Again, this is a service that you can offer on the Jungle Market. 13 – Write copy for Amazon seller product listings. Speaking of writing copy, not just any schmoe can write persuasive descriptions for products. It takes a real professional with years of experience to do that. And if you’re one of those people who knows how to write great sales copy, then here’s another way that you could help Amazon sellers. In fact, if you combine this with consulting services, and perform split-testing for sellers using a service like Splitly, you could easily earn yourself quite the pretty penny. 14 – Create videos for Amazon seller product listings. Customers love videos. That’s why so many Amazon sellers want to get cool videos made. However, video work can be pretty hard to do. Fortunately, there’s ways to find professionals that can create videos. And you might just be the kind of video professional that can offer your services to Amazon sellers on the Jungle Market. 15 – Offer consulting services for Amazon sellers. Maybe you’re already an experienced Amazon seller? Why not sell what you know, too? We’ve discovered that one of the biggest things that keep so many people from jumping on Amazon to get money is that they’re afraid of taking that first step. Basically, they want a coach to hold their hand. If you’ve already taken that big leap and have some war stories to tell and encourage, then why not offer your services as a consultant? In fact, you might even be able to combine the other ways to get money selling services to create a holistic practice. 16 – Help Amazon sellers with digital marketing. But what if you’re not a coach and more of a numbers/analytics type person? No worries! You can also help people out with their digital marketing. Amazon PPC is probably the best way to sell private label products, but it takes a real SEO and digital marketing whiz to use it well. And if that’s an area that you’ve mastered, then why not offer help on the Jungle Market to other Amazon sellers starting out? 17 – Proofread ebooks for Amazon authors. Like I wrote above, it’s possible to make hundreds of thousands of dollars selling books that you write on Amazon. For many, writing is tough. And to write that kind of volume may not be the easiest way for you to get money using Amazon. However, if you’re someone who enjoys reading more than you write and can easily point out mistakes, why not become a proofreader for Amazon authors? 18 – Design ebook covers for Amazon authors. Going back to the graphic design listing idea, you can also offer ebook cover design services to authors, too. A great cover can make or break an ebook. Therefore, a great cover brings a great price. And if you can create 3D digital mockups, you’ll truly be a star with Amazon authors. This is potentially another service you can offer on Jungle Market. 19 – Sell web design services for Amazon seller brand pages. Did you know that in order to register your own brand on Amazon you need a fully functional website? That’s a pretty scary concept to consider for a lot of Amazon sellers since building websites isn’t something just any layman can do. But if you’ve got some web development skills or know a little WordPress–or even if you know how to create something super simple like a Shopify page, then setting up a web page might be another create service that you can offer the Amazon selling community. Other ways to get money from Amazon. 20 – Take part in the Amazon associates program. Affiliate marketing is a method of advertising another business’s products with special links and earning commissions when shoppers purchase based on your link. One of the biggest affiliate programs around, the Amazon associates program, is a killer way to get money using Amazon. All you have to do is make yourself as an influencer. Once you’ve joined their affiliate program, simply create a blog or a social media account and start driving traffic to Amazon with your affiliate links. Once people purchase the things you’re recommending (and even if they buy stuff that’s not what you recommended), you’ll get paid a portion of that sale. Related Link: Learn more Amazon’s affiliate program (Amazon). 21 – Buy discount Amazon products and resell on Ebay. This one kind of works in reverse for Amazon sellers, but you can actually find deals on Amazon to later resell on Ebay. Those deals you can find via lightning deals on Amazon, promotional sites, or just Amazon going whacky and pricing things in the ditch. As an added bonus, you can use a website like Keepa to help you find deals. 22 – Get a $10 Amazon gift card. There are survey sites all over the web that will pay you in Amazon gift cards. All you have to do is go on the site and enter your details then follow the instructions. Believe it or not, there’s a lot of people who survive just on finding deals like these to collect gift cards and buy their day to day things on Amazon. While it’s not necessarily a way to start a real business with Amazon, it certain is a way to get money. 23 – Dropship from Amazon to Ebay. Another hack that I’ve seen a few times on Ebay are Ebay sellers who list private label Amazon products on Ebay at a marked up price. Then, once a sale is made, they order the product from Amazon to the winning buyer. They then earn the difference between what the product sold for on Amazon and what they sold it for on Ebay. It’s a nickel and dime way to go about things, but it does ensure top quality products delivered fast, and if people are willing to pay more for stuff–stuff that you don’t own mind you–why not try it? 24 – Work for Amazon as a Mechanical Turk. Did you know Amazon offers part time jobs for people who pretend to be machines? That’s right! As a part of their Mechanical Turk program, Amazon will pay you to do the processes that many think are done by machines. This includes image and video processing, data verification and clean up, information gathering, and data processing. It’s all fairly simple work and it can all be done from the comfort of your own home. Related article: Check out the Mechanical Turk program here (Amazon). 25 – Trade in your iPhone or other used items on Amazon for gift cards. Finally, another way to get money using Amazon is just by giving them your old stuff. This includes your cell phone, too! And if you’ve purchased those items from Amazon, they may already have an offer waiting for you. Simply go to Amazon’s Trade-In page and see what you can get. In fact, I just made $25 while writing this article about it! Now I just gotta figure out what I’m going to spend my gift cards on. Probably books. Duh. Related article: Amazon Trade-in Program (Amazon). As you can see, there’s tons of cool ways to get money using Amazon. And since you now have this awesome list, you’ll easily be able to find one that best suits your needs. If you know any other cool ways to get money with Amazon or have questions about some of the methods listed here, be sure to leave a comment below. And Amazon selling is easy, especially when you have the right tools. Learn a little more about the Jungle Scout suite of apps by clicking the button below. I like the idea on marketing associate. would like to find out how to get started. can you refer me where to go? thanks. Love this additional info. Iv just signed up for jungle Scout Web app, and getting used to the set up. looking at as much training material as I can and starting searching for products. Great ideas! I’m definitely bookmarking this page. Can Jungle Scout chrome extension be used to search and find used low priced FBM books with low Sales rank and sell FBA? The Chrome Extension only picks up the listing that’s in a Buy Box. To find products that have variance between FBM and FBA (also known as Zen Arbitrage), you will have to manually check, as I’m not sure there’s any app out there other than Keepa (maybe?) that can do that. Hello Dave, I am very impressed with all the opportunities Amazon provide, you did it a great job collecting all that information, however you missed one way to make money from Amazon, and that is Selling Services. I started selling home cleaning service through Amazon around year ago and now my business has expanded to landscaping services, all type of floors restoration services and just starting with handyman services as well. Definitely Amazon has been our best marketing tool. Maybe we can work on an article together! I have been using the Jungle Scout Chrome Extension for months now and have found many potential products for Private Label. Thank you for sharing these 25 ways to make money on Amazon. Very insightful. Awesome job! Glad you liked it! So many extremely useful information! Some of them can change my life. Thank you so much, Jungle Scout. Can Jungle Market be used to offer proof-reading services to Amazon e-book authors? It isn’t mentioned in that section although I would think it would be a great place to start. I know I’d like to offer proof-reading services to Amazon e-book authors, as I am an e-book author myself, and I know quite a bit about proof-reading and copy-editing. I think it’s definitely something that’s been discussed. You might drop Joel a note on the site.